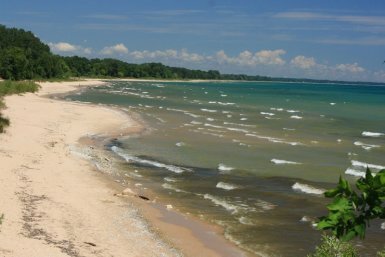 The Fund for Lake Michigan is supporting Ozaukee County’s stormwater remediation activities on the Lake Michigan shoreline at Harrington Beach State Park. The park has experienced frequent beach closures and advisories due to poor water quality caused by concentrated stormwater runoff in two locations where roads terminate at the beach. Ozaukee County will design construction-ready plans for naturalized methods to capture and infiltrate runoff before it reaches the beach, reducing contamination and improving water quality as well as enjoyment of the park.